This beautiful St. Patrick’s Day bling jewelry triples your sparkle on St. Patrick’s Day … and you’re lucky enough to get the whole set of 3 for steal! Featuring bright beads and faceted pavé clusters that shimmer and shine, the clover jewelry set offers fun, festive style, whether worn together or separately. Set of 3 includes 1″ long shamrock earrings, 9″dia. stretch bead bracelet and necklace with 1 1/2″ pendant and 17 1/2″ silvertone chain with claw closure. Plastic, zinc. 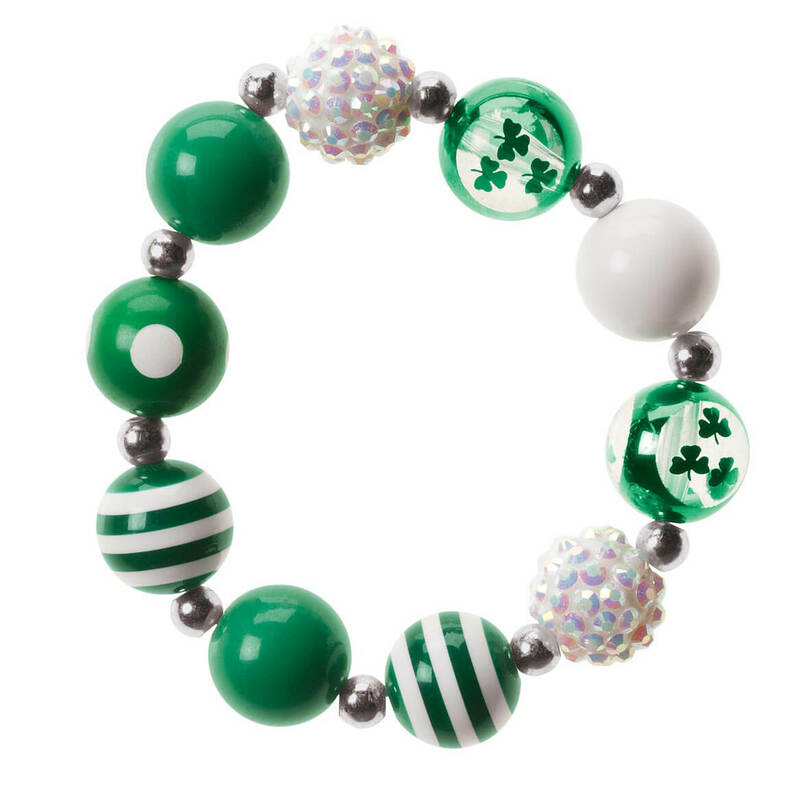 You’ll dazzle on St. Patrick’s Day with a wee bit of bling and plenty of green in this fun, festive St. Patrick’s Day bling stretch bracelet. Chunky painted beads with shamrocks, stripes and faceted sparkles adorn the fancy look—and as luck would have it, the lightweight style slips on easily and wears comfortably. A charming little gift for St. Patrick’s Day, the 9″ dia. shamrock bracelet fits any size wrist, whether Irish or not! Plastic. Offering dazzling glamour without fuss, this Winter Wonderland stainless steel charm bracelet is crafted of durable, hypoallergenic stainless steel—shining without scratching, tarnishing or irritating sensitive skin! Sparkling with two silver pavé round gems, two blue faceted charms, one painted snowman, one dangling silver mitten and one dangling silver snowflake, this Christmas bracelet is statement-making fun, all winter long. Features snap-lock closure. 7″ long when open; charms hang 1″ in total length. Make a bold style statement while keeping impeccable time. 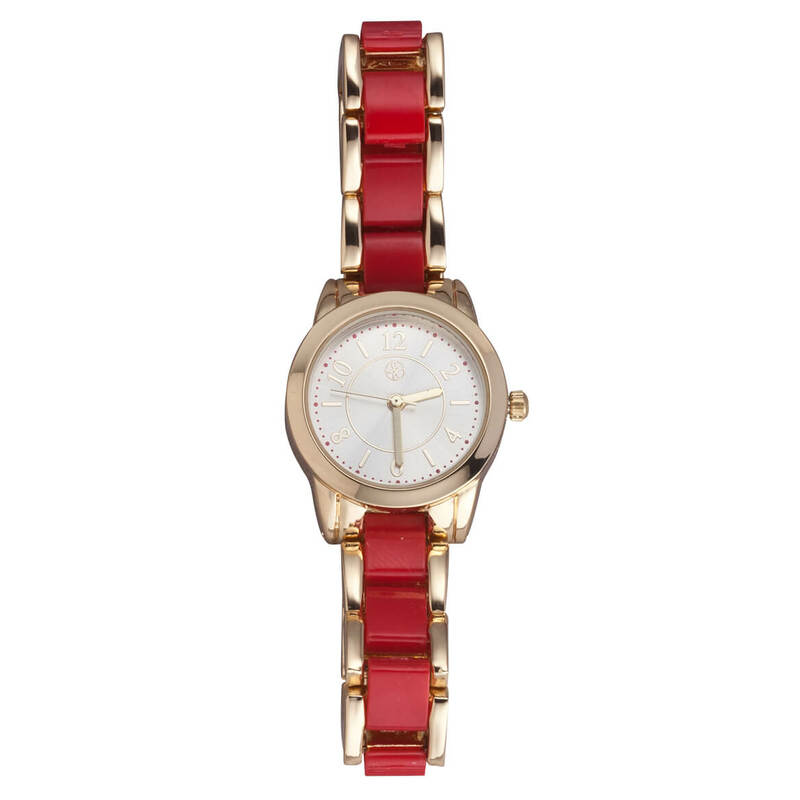 Sleek gold-tone women’s fashion watch incorporates eye-catching red links into its elegant bracelet. The brilliant gold-tone easy-to-read analog watch helps ensure you’re always on time. Boxed for easy giving, it makes a great gift. 7″ long alloy and durable plastic wrist watch with jewelry clasp is designed to fit most women. Includes silver oxide battery. 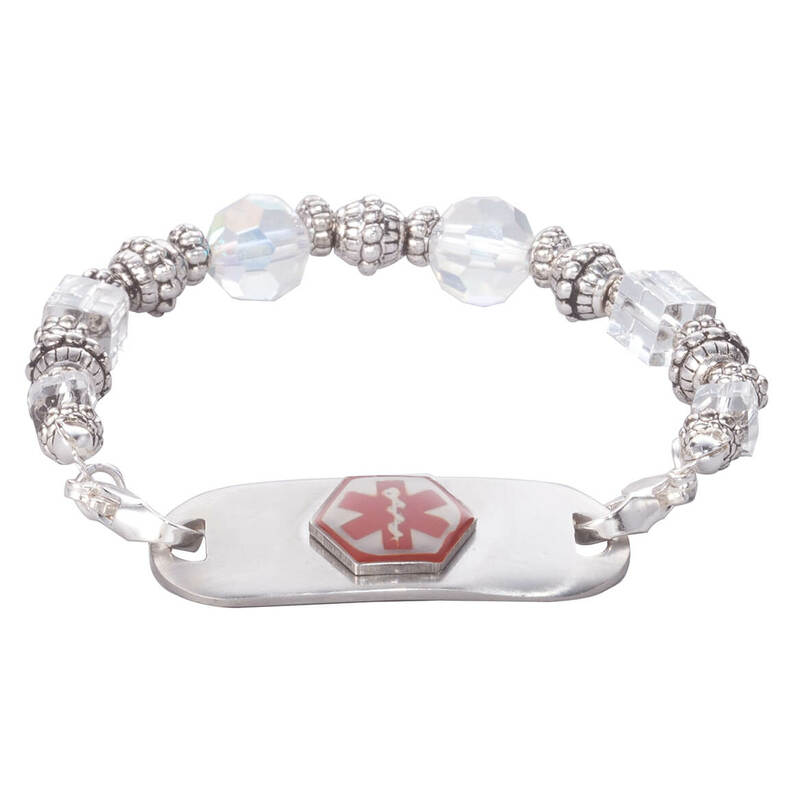 Much more than fashionable jewelry, our silvertone and acrylic personalized Medical ID beaded bracelet attaches to each side of an engraved medical ID tag. Care providers see at a glance the medical alert symbol on one side and your emergency contact, allergies or health condition on the other. Specify personalization up to 2 lines, 15 letters/spaces each line. 7 1/2” long medical alert bracelet with lobster clasp stretches for a perfect fit. Wipe bracelet and tag clean with dry jewelry cloth. 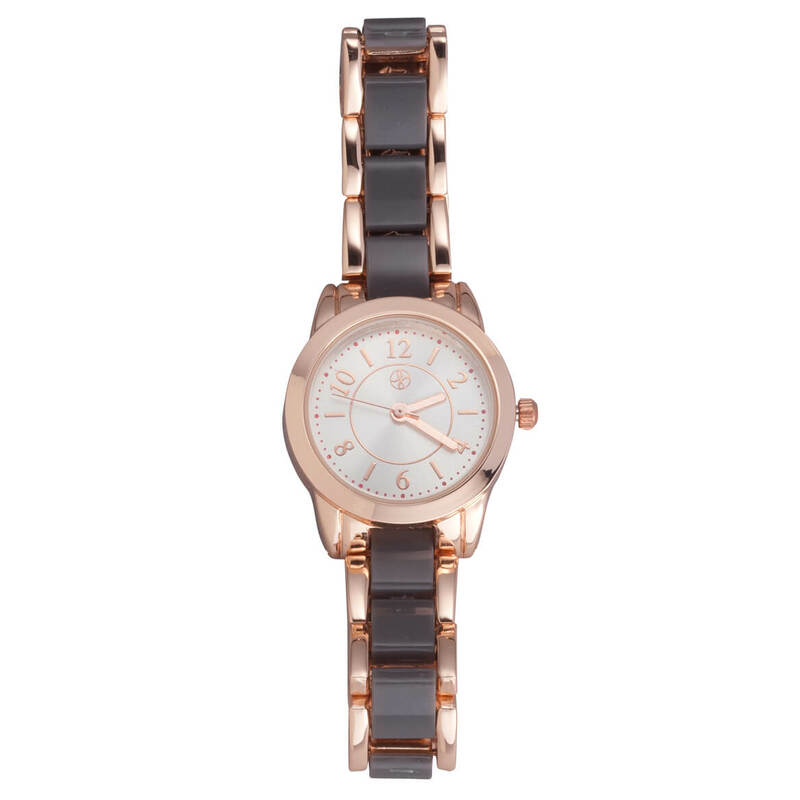 On-trend rose gold women’s fashion watch dazzles with a stunning two-tone design. Versatile timepiece features a rose gold case and easy-to-read dial with a second hand. The beautifully contrasting wrist watch features rose gold accented with gray links and secured with a jewelry clasp. Boxed for easy giving, it makes a great gift. 7″ long alloy and durable plastic women’s watch is designed to fit most. Includes silver oxide battery. Personalized medical ID braided bracelet is a stylish way to display a medical ID tag. 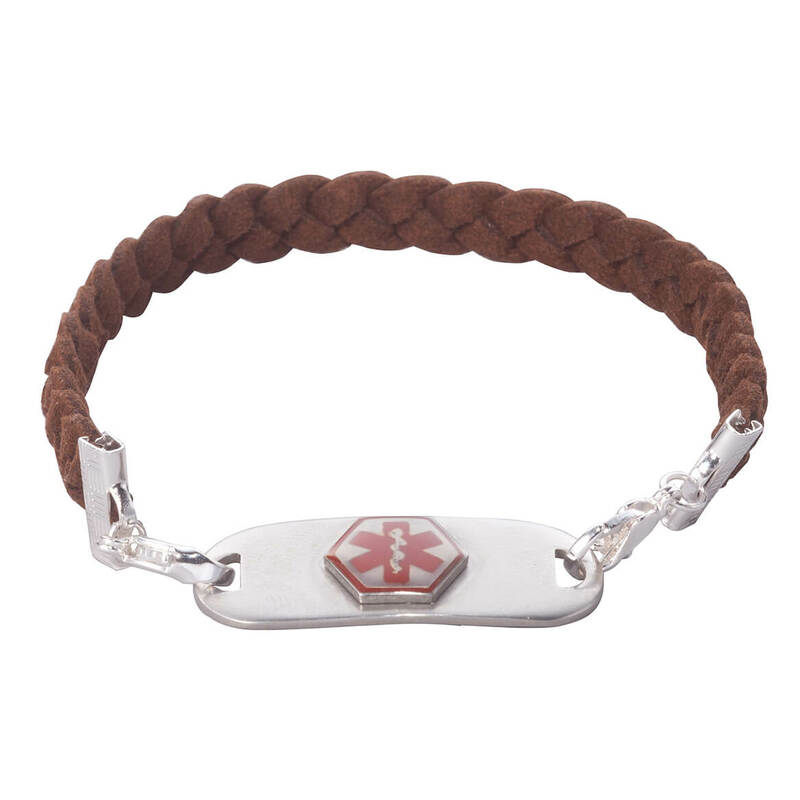 Perfect for men or women, this 10” long braided faux leather band with silvertone lobster clasp attaches to each side of an engraved medical ID tag. Care providers see at a glance the medical alert symbol on one side and your emergency contact, allergies or health condition on the other. Specify personalization up to 2 lines, 15 letters/spaces each line. Wipe medical alert bracelet and tag clean with dry cloth. 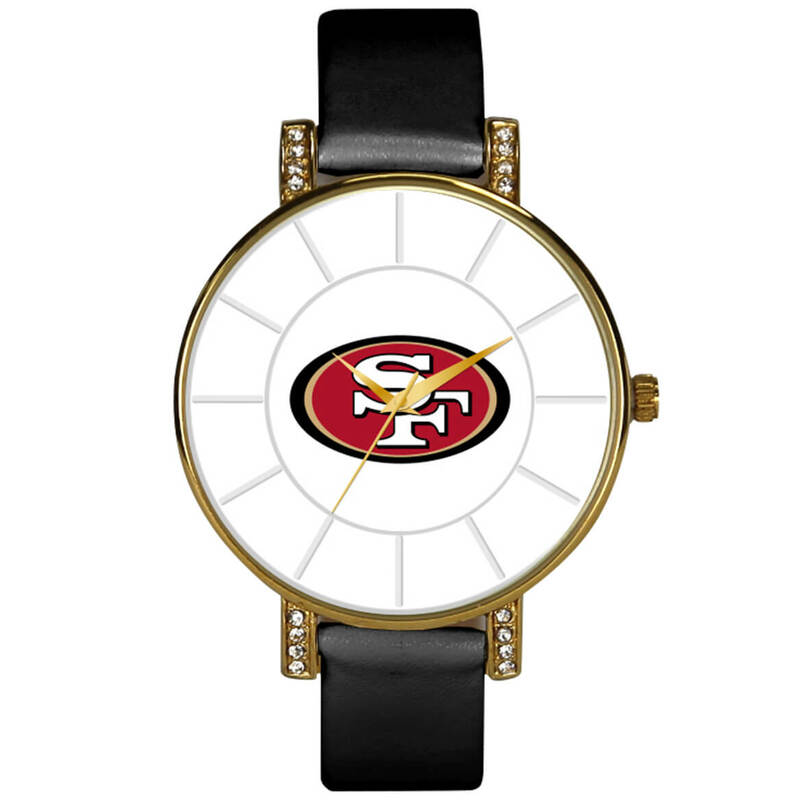 Express your team spirit with this sporty yet feminine Women’s NFL Sparo Lunar Sports Watch. This stylish timepiece features a classic white dial with the NFL logo of your choice. The fashionable goldtone case is accented with acrylic crystals and a coordinating leather-look strap. Precision quartz movement with second hand helps you stay on time and is water-resistant to 30 meters. Makes a great gift for your favorite football fan! Specify team. Measures 8 1/2″ L with adjustable polyurethane strap. Stainless steel back. Includes limited lifetime warranty. Silverplated ID bracelet adds shimmering charm that’s truly personal. 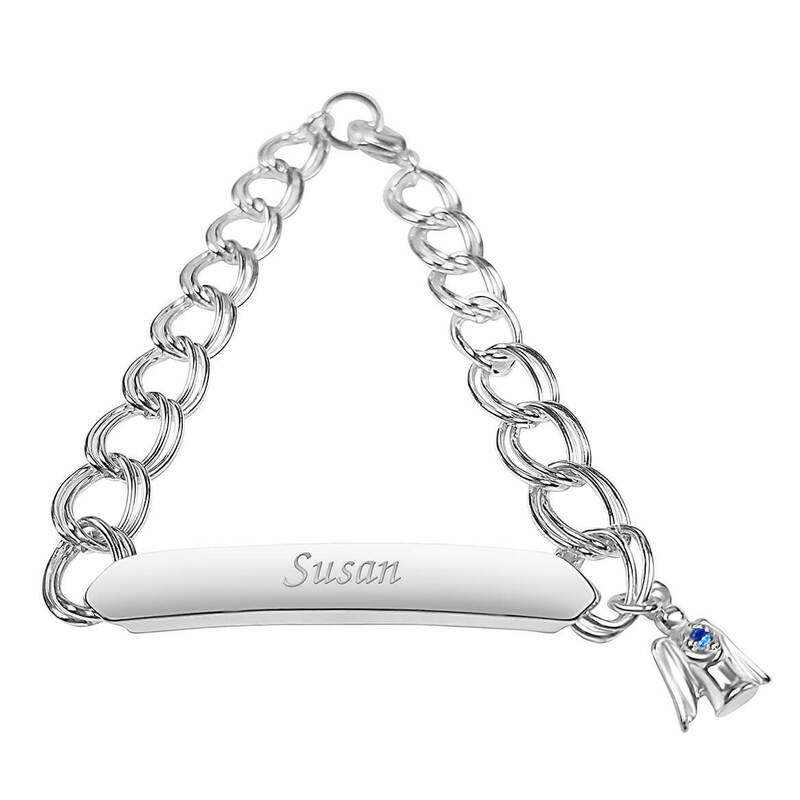 ID bracelet features a beautiful double-link chain, sleek name plate and angel charm with your unique birthstone. Specify month and name: 1 line, up to 9 letters/spaces, upper/lower case. 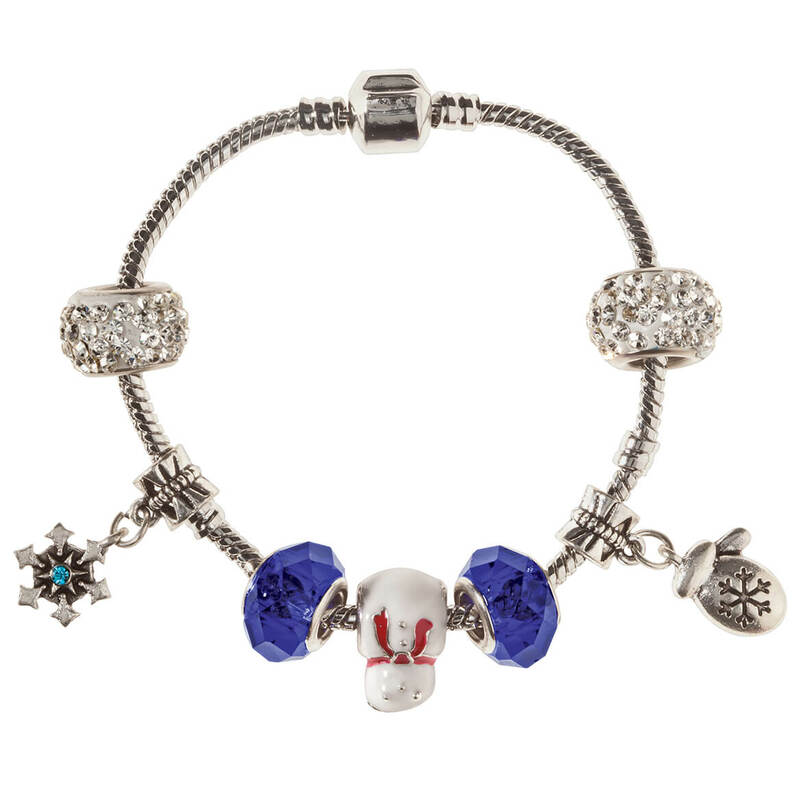 7″ L bracelet features a lobster clasp, 1 1/2″ long plate and 1/2″ high angel. Silverplated brass resists tarnishing. Allow 4–6 weeks for delivery. From its brilliant yellow design to its fashionable metal strap, this Yellow Face analog watch makes a bold style statement! Large 1 5/8” dia. face features stand-out white hands and dots, second hand and decorative auxiliary dial. Its case back is stainless steel and the quality-crafted alloy band secures with a snap closure or deployment clasp to fit most wrists. 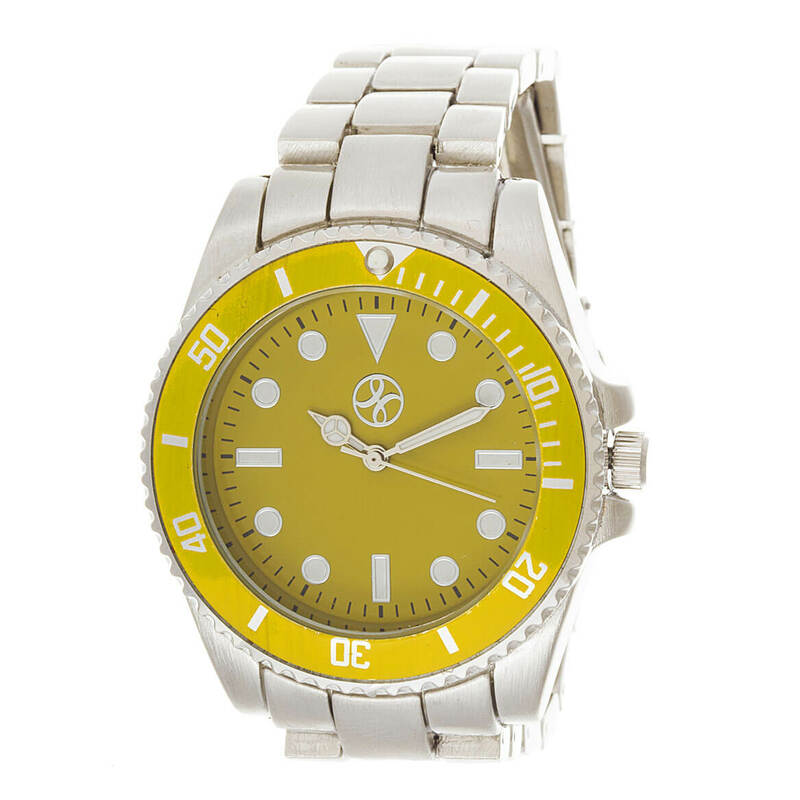 With an 8” total circumference when fastened, this metal watch is perfect for men or women. Compare at $24.99!